Avene Cleanance Sunscreen SPF50+ ensures very high protection for acne-prone skin. 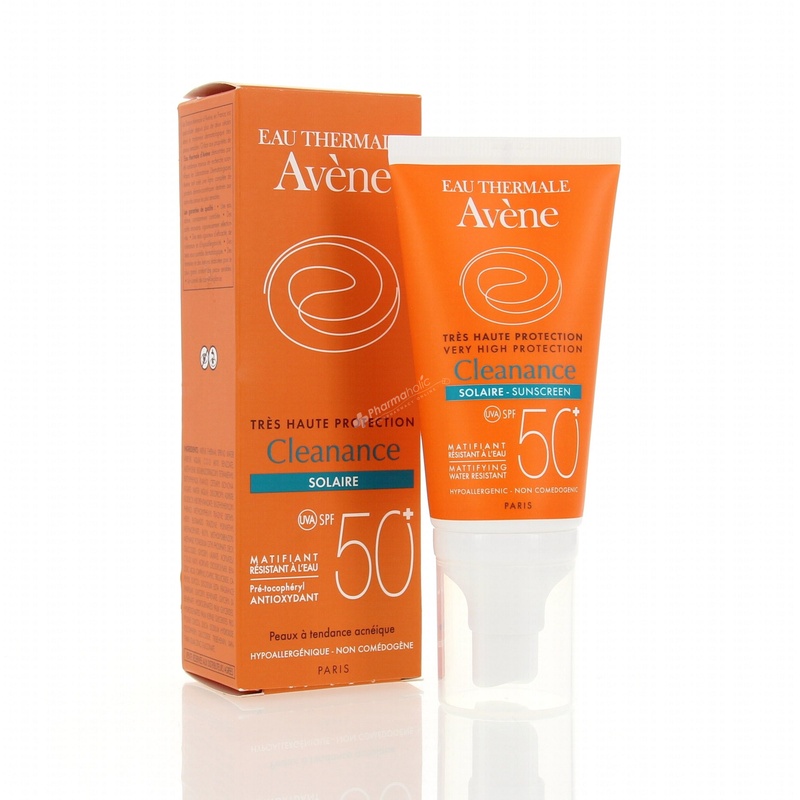 Avène Cleanance Sun SPF 50+ care ensures a very high sun protection of the acne-prone skin of the face. It is ideal for oily skin with acne prone and skin exposed to intense sunlight. - A complex of complementary and synergistic photoprotective active ingredients that guarantee a minimum of chemical filters in formulas. - Pre-tocopheryl, the photostable precursor of vitamin E, provides additional cell protection. - Avène Thermal Spring Water has naturally soothing and anti-irritant properties. The light and fluid texture of this care protects, hydrates * and matifies, with a dry touch. It is resistant to water. The presence of Monolaurin matifies the skin thanks to its sebum regulating action. Without a white effect, it is photostable and contains neither silicone nor paraben. Complete facial protection by using SPF 50+ Spray on your entire body. Reapply frequently in case of prolonged exposure and after each bath. After exposure, moisturize your skin using After-Sun Repair Milk. Starch octenyl. BIS-ETHYLHEXYLOXYPHENOL METHOXYPHENYL TRIAZINE. CETYL PHOSPHATE. SILICA. ACRYLATES / C10-30 ALKYL ACRYLATE CROSSPOLYMER. BENZOIC ACID. CAPRYLIC / CAPRIC TRIGLYCERIDE. CAPRYLYL GLYCOL. DECYL GLUCOSIDE. DISODIUM EDTA. FRAGRANCE (FRAGRANCE). GLYCERYL BEHENATE. GLYCERYL DIBEHENATE. Glycerides. PROPYLENE GLYCOL. SODIUM HYDROXIDE. TOCOPHERYL GLUCOSIDE. Tribehenin. XANTHAN GUM. ZINC GLUCONATE.